Daredevil returned to New York Comic Con this year with exclusive clips and some exciting casting news. During the panel, new cast member Wilson Bethel confirmed that he will be playing the iconic villain Bullseye this season. 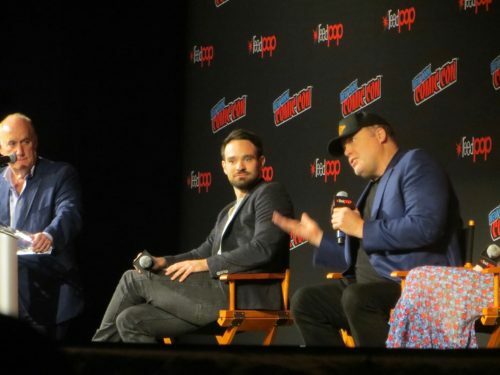 Also joining the panel for a Q&A moderated by executive producer Jeph Loeb were stars of the show Charlie Cox (Matt Murdock), Elden Henson (Foggy Nelson), Deborah Ann Woll (Karen Page), Joanne Whalley (Sister Maggie), Vincent D’Onofrio (Wilson Fisk), Jay Ali (Rahul “Ray” Nadeem) and showrunner Erik Oleson. Season 3 finds Matt Murdock returning after being presumed dead to face off with his old enemy Wilson Fisk AKA King Pin. He has isolated himself from old friends Karen and Foggy but now has Sister Maggie, who will act as his moral compass this season. Charlie Cox joked during the panel it seems like whenever Matt Murdock hits rock bottom there’s something even worse always around the corner. This season that seems to be Bullseye. In the character teaser released by Netflix and in footage shown at the panel, we see Bullseye donning the red Daredevil suit and besting Matt in combat. Bullseye’s introduction is a result of the return of Wilson Fisk, the main villain from Season 1. In exchange for the return of his wife, Fisk makes a deal with the FBI who bring in Agent Poindexter aka Bullseye. This also leads to the introduction of Agent Nadeem played by Jay Ali. Vincent D’Onofrio makes it clear that Fisk’s real intention is to get rid of Matt Murdock, who he describes as a “gnat” Fisk wants to crush. He manipulates the unstable Bullseye to achieve that. D’Onofrio praised Bethel for having a lot of guts to play a character like Bullseye. While the Bullseye in the show will be similar to the comics, Erik Oleson explained that Marvel gave them a lot of room explore Bullseye’s origins and things will get pretty weird on the show. Jay Ali added all of the characters this season will have to make a choice of whether they give into the darkness or stay in the light, possibly hinting that his character might give into Fisk’s influence as well. Despite so many new cast members, we’ll still see plenty of Foggy and Karen this season as they deal with Matt’s return. Elden Henson said Foggy’s journey will focus on finding out who he is without Matt, and we’ll also get to meet his family this season. We’ll also learn more of Karen’s backstory according to Deborah Ann Woll. All 13 episodes of Marvel’s Daredevil Season 3 premiere worldwide October 19 on Netflix.